As runners begin planning their race schedules for the season, Stride bloggers offer up their favorite races as suggestions. If you're looking to break away from the many races on Chicago's flat streets this summer, look no further than the Bix. This world-famous race takes place in Davenport, Iowa, which is less than a three-hour drive from Chicago. Held the last Saturday of each July, this challening 7-mile course is one of the best in the Midwest. The course is hilly and the weather is hot and humid, but there is great music, a cheering crowd and runners in a variety of costumes.The out-and-back format of the race also offers the rare chance to run alongside elite runners from from all over the world. Prime People Watching: With a field of 20,000 runners and a strong costumed contingency, the human scenery is fantastic. Elite Navel-Gazing: Meb Keflezighi, Joan Benoit Samuelson and Bill Rogers are all long-time Bix participants. Wonderful Water Stops: Slip'N Slides, hoses, sprinklers, water guns -- and, of course, just some water in regular cups, too. The eager crowd takes their hydration responsibilities very enthusiastically. Post-Race Party: Along with the standard fare, there are more snacks, popsicles and tasty treats than you can shake a running shoe at. To me, the Bix is more than just a hilly 7-mile race. It's an event. It's a holiday. It's a reunion. Most of all, it's a rite of passage. As a testament to how much I enjoy this race, I'm running the event for the 11th time this summer. 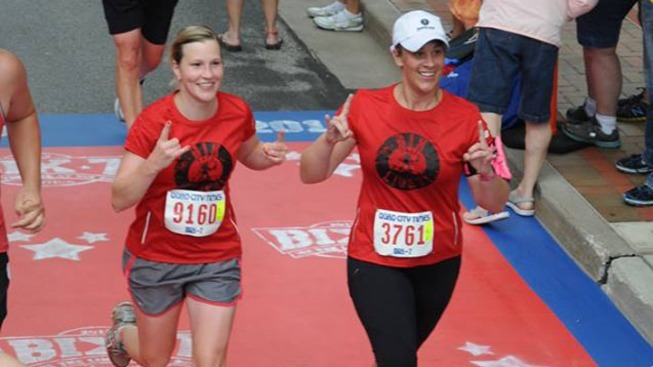 I've run this race while in the best shape in my life and in the worst shape in my life, while I was pregnant and when I became a new mom, and while I was injured and healthy. As you're planning your race schedule for the season, definitely consider adding the Bix and make a vacation out of it. Registration for the July 25 race is already open. Adrea Beatty is a writer by profession, a jock by trade and a runner by coincidence. After wrecking her joints playing sports, she now spends her time chasing down her husband, pushing her daughters in a stroller and shuffling along with her trusty labradoodle running partner. For more from Adrea, check out http://rulesforrunning.com.